This charming coming of age story takes place in Maine during the early 1940's. The hero, Homer Wells (Tobey Maguire), has been raised in St Clouds orphanage. Dr Larch (Michael Caine, in one of his best performances for years) takes an almost paternal interest in the welfare of his charges, but he has a soft spot for Homer, whom he trains as his assistant. Dr Larch also performs abortions on demand, even though they are illegal. But Homer feels that there is more to life than helping Larch at the orphanage and decides to strike out on his own, hoping to experience more of the world. When the beautiful Candy (Charlize Theron) and her fighter pilot boyfriend (Paul Rudd) come to the orphanage for an abortion, Homer leaves with them. During his mini-odyssey, Homer comes to realise his destiny and find his place in the world. -- Audio Commentary with Director Lasse Hallstrom, Screenwriter John Irving and Producer Richard N. Gladstein. This is a really interesting commentary which gives a wealth of background information not just on the basic adaptation from novel to screen, but how much was actually changed after the first draft of the script. The bulk of the commentary is between Hallstrom and Irving, and they go into quite a bit of depth about how they arrived at the final version we see on screen. 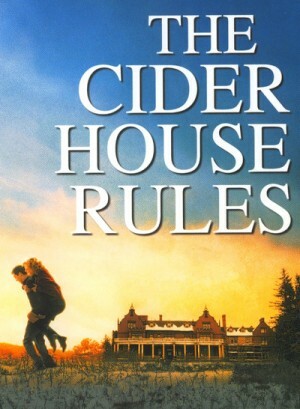 -- The Cider House Rules: The Making of an American Classic (22 min) is an above average featurette documenting the adaptation from novel to screen, with good interviews with Maguire, Theron, Caine, Irving and Hallstrom, with some interesting comments by none other than Stephen King.